For some people, a headset is not just an accessory for a fun-filled gaming experience. It is a vital component of their job description. It is a tool needed to carry out their jobs effectively. If you are in this select group, then it would interest you to know that you have plenty of options available to you. This variability owes in part to the many technological innovations in office headset development by manufacturers in recent years. In really doesn’t matter how big or noisy your office is or what your budget is, we have got you covered with the considerations to factor during your purchase and a complementary list of the best office headsets currently available. Wired vs. Wireless. The actual comparison is budget versus convenience. If you are on economy drive but need a headset with terrific performance, then place premium-grade wired headsets in your crosshair. Wireless headsets are often pricier than wired headsets of comparable performance. Therefore, if money is not a problem, then you should get a wireless headset. The major advantages are convenience and increase in work productivity, as movement is not restricted. Single-Ear vs. Dual-Ear. The option you choose depends on the amount of background noise you have in your office space and if you need to hear what is happening around you while using the headset. For example, call center staff would find dual-ear headsets to be best suited for their jobs. Secure Fit. 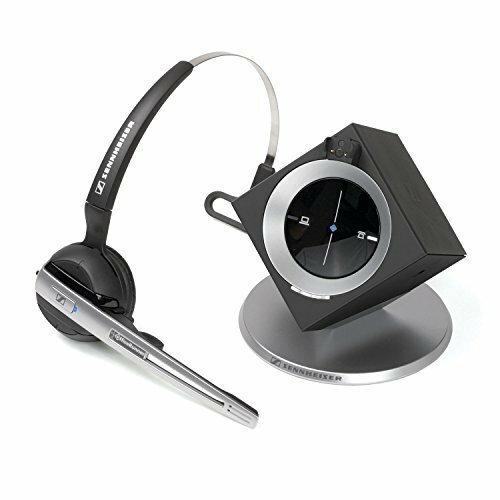 Office headsets come in different styles. The common types are the headband headsets and the ear loop headsets that have lighter weight. If you are not averse to wearing clunky stuff on your head and need to wear a dual-end headset, then you should look at the headbands. These types of headsets keep the ear pads in place securely. For those on the opposite end of the curve, ear loops would be a preferable choice. For a long time, the office headset sub-industry has been the playground of the Plantronics band. They lorded the domain with multiple offerings of high performance office headsets. That was until Sennheiser threw a jab and floored Plantronics on home turf with the Sennheiser OR-10. There is no dispute that the Sennheiser OR-10 is the best office headset in the market, and its 4.8 star rating [out of 5] on Amazon as at the time of writing this review favors this assertion. The various Plantronics models, including the headsets occupying #2 and #3 on this list, have nothing on it. The Sennheiser OR-10 is aesthetically pleasing and lightweight at only 0.78 ounces or 0.05 pounds—in comparison, the Plantonics Savi W720 (#2) weighs 1.8 pounds, and the Plantronics CS530 (#3) weighs 1 ounce. Furthermore, you can choose between two versatile wearing styles— on the ear (ear loop) or over-the-head (headband). The ear loop style has three different loop sizes to choose from for optimum fit. The Sennheiser OfficeRunner is versatile in that it is compatible with 98% of corded office phones. In addition, you can use it with softphones from well-known brands like Avaya, Cisco, Microsoft, and others. You can also use it with VoIP services like Google Voice, GoToMeeting, Skype, et cetera. Furthermore, its excellent noise-reduction microphone makes it ideal for dictation programs like Dragon Voice. However, the major talking point of the Sennheiser OfficeRunner OR-10 is its outstanding wireless range of 400 feet. You can avail of the high quality, clear, accurate sound it produces for an impressive 12 hours of continuous talk time. Even better, you can fully charge its battery in only 1 hour. 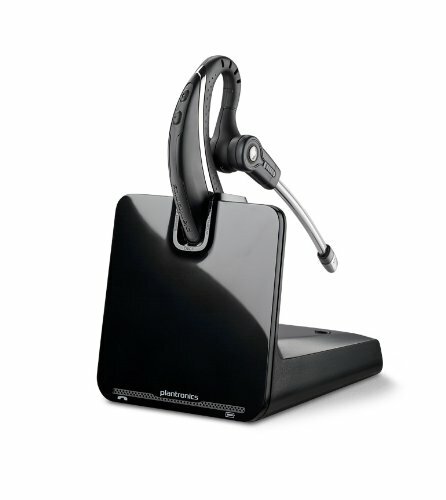 The OfficeRunner OR-10 offers the standard full range of controls often featured in premium office headsets including: Adjusting the volume, muting the microphone, and switching between a desk phone and softphone. Another interesting feature is the 3-year warranty it sports that also covers the battery. Now, isn’t that a pleasant surprise? The Plantronics Savi W720 has a dual-earpad design that does well to eliminate background noise to a large extent. It also features a noise-cancelling mic for seamless communication. The Savi W720 is very versatile as it permits you to manage your PC, mobile, and desk phone calls effortlessly. Furthermore, it outputs high definition, clear, natural sound, made possible by its advanced wideband audio using CAT-iq technology and enhanced digital signal processing. It has an extensive wireless range of 350 feet, complemented by a removable, rechargeable battery that lasts for upwards of 8 hours on a single charge. Since the battery is removable, you can easily swap it with another charged battery for extended talk time without having to wait for the battery to charge. Perhaps the W720 biggest draw is its DCET wireless security that eliminates Wi-Fi interference and ensures confidentiality and privacy of your conversations. Controls available on the W720 include one-touch call answer/end, mute, flash, and volume adjustment. The Plantronics CS530 has plenty going for it; it sports a sleek monaural design, delivers high-quality sound, and carries an affordable price tag. 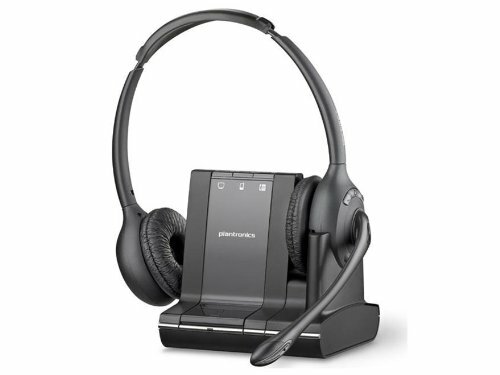 The best use for the Plantronics CS530 is as a wireless headset for desk phone communication. In addition to having four comfort-tested wearing options, the Plantronics CS530 features an extended boom and noise-canceling mic. It also offers two modes—a narrow band mode to extend talk time, and a wideband mode for clearer conversations. The CS530 features a SoundGuard technology that protects against audio spikes owing to acoustic limiting and ensures a comfortable listening experience during communication. Like the Plantronics Savi W720, the CS530 has a wireless range of 350 feet, complemented by voice-dedicated DECT 6.0 technology to provide much needed security for your communications. Also available are the usual controls in high-end office headsets—one-touch call answer/end, volume adjustment, and mute. You only get 6 hours of continuous talk time. However, that is decent considering its sub-$200 price tag.